The status of Montserrat’s marine programme in collaboration with The Waitt Institute was the focus of Hon. Minister of the Environment Claude Hogan’s address to the United Nations last Monday. Minister Hogan spoke as part of the UK Delegation to the UN Ocean Conference 2017, taking place in New York from June 5 to 9. The conference, he said was a historical one, as it is focused on Sustainable Development Growth 14 (SDG-14) which deals with the marine environment. Minister Hogan in his address shared the Government of Montserrat’s commitment to Ocean Action 18142. These action deals with science driven and community-led marine spatial planning with the goal to protect 10% to 30% of Montserrat’s near-shore marine environment as no take marine reserves. 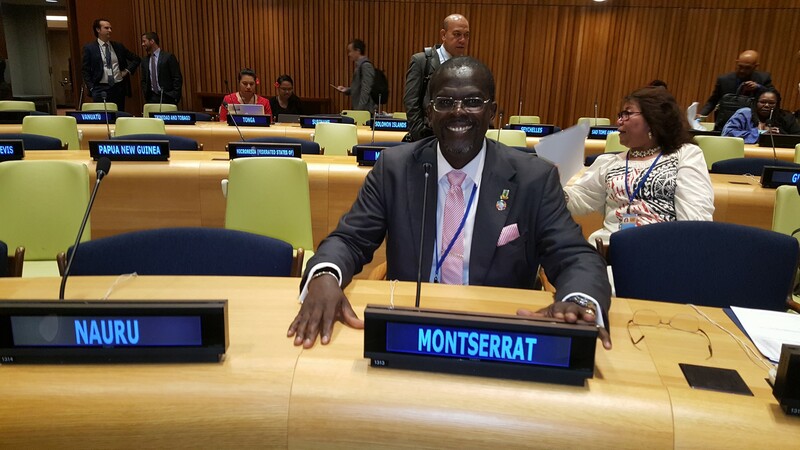 The official said Montserrat was committed to sustainably managing marine reserves and to implement a fisheries management framework and the development of Montserrat Ocean’s Trust, to support sustainable financing of ocean management research and education. The marine spatial plan is slated to be completed by December 2017. UN Ocean Conference aims to be the game changer that will reverse the decline in the health of our ocean for people, planet and prosperity. It will be solutions-focused with engagement from all and build on existing successful partnerships and stimulate innovative and concrete new partnerships to advance the implementation of Goal 14. Listen to Minister Hogan’s address below.